There is something about a quesadilla that sort of makes it perfect of all occasions. You can fill them with anything, serve them as an appetizer, snack or meal, and you can pretty much rest assured that everyone will enjoy it. You just can’t go wrong! When I co-authored my second cookbook, our focus was on Superfoods. So I thought a superfood quesadilla would be a perfect fit! And it was! This recipe has been very well received because, well…. it’s delicious! Yes, it’s a bit out of the ordinary for a quesadilla, but sometimes it’s worth it to be a tad bit adventurous in the food department. I promise you won’t regret it. Also, be sure to check out my newest cookbook! wow I love that addition of mango in these! that sounds amazing! I have a bunch of mangos on my counter right now. I will definitely be making these soon! 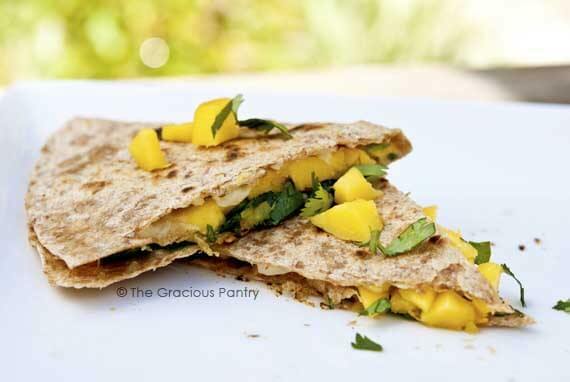 I never would have thought to put mango inside a quesadilla, maybe in a salsa on top, but not in it. Definitely worth a try! Erena – It’s good stuff!